The legend was changed according to the decisions made during the 14th BSRN Scientific Review and Workshop in Canberra. 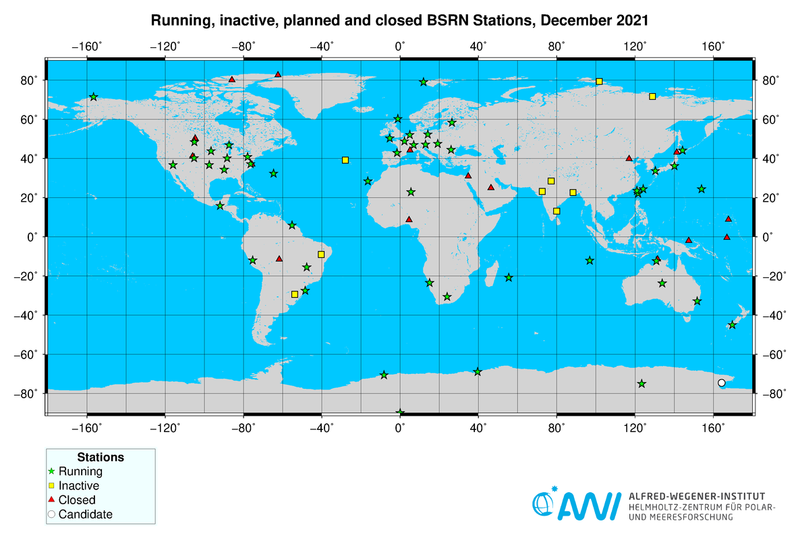 Green stars denote BSRN stations which have already successfully submitted data to the WRMC. Yellow squares will be used in the near future for stations which failed to submit their data within an acceptable time. Red triangles are used for BSRN stations which are closed. White dots mark candidates which are stations that have been provisionally accepted as BSRN sites, but have not yet submitted data to the BSRN archive to complete the process of becoming full-fledged BSRN sites. Click on the images to get the full-resolution version or download a printable PDF.